König von Frankreich (1754-1793). 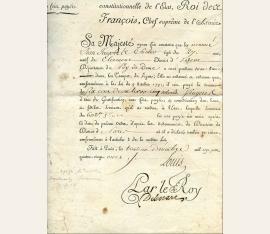 Payment instruction signed ("Louis"). Paris. 1 S. Folio. 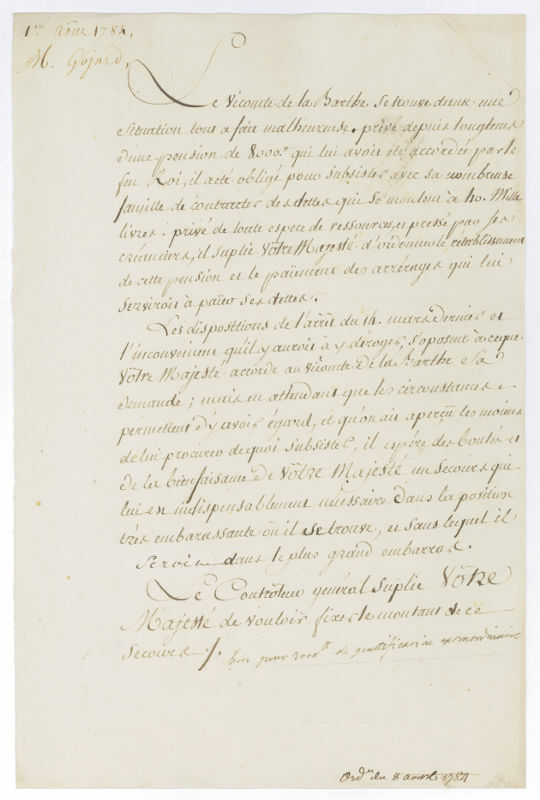 To the "Trésorier Général de ma Liste civile", Jean-Baptiste Tourteau de Septeuil (1753-1812), instructing him to pay 200 Livres to the "Concierge de mon Chateau de Compiégne" S. Pascal. 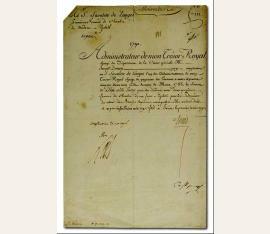 - At the time of writing, Louis XVI was already de facto a prisoner. In December he refused to sign a bill creating a State Church (not recognized by the Pope or the King), his end drew near: after the siege of the Tuileries in August 1792, he was arrested; he was guillotined in January 1793, and his wife Marie Antoinette in October. - Some edge wear; paper defects; one large, reinforced tear. König von Frankreich (1754-1793). Schriftstück mit eigenh. Zusatz O. O. 1 Zeile auf 1 S. Folio. Eine Eingabe des "Controleur général" für den in Not geratenen Vicomte de la Barthe mit der Bitte um Unterstützung, die der König mit den Worten genehmigt: "Bon pour 2000 l[ivres] de gratification extraordinaire". [Ludwig XVI., König von Frankreich]. Brief mit U. von Sekretärshand. Paris, 31. Dezember 1791. 1 S. Folio. – Stärker angestaubt und fleckig und mit starken Randläsuren. Schriftstück mit eigenh. U. 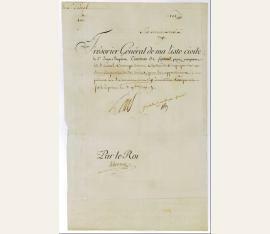 ("Bon / Louis"). 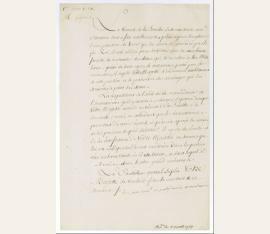 Ordering the Administrator of the Royal Treasury Joseph Durney to pay 10,000 Livres to the two First Ladies in Waiting of Madame Elizabeth "to indemnify them for the return of the unused candles to which they have right" (transl.). 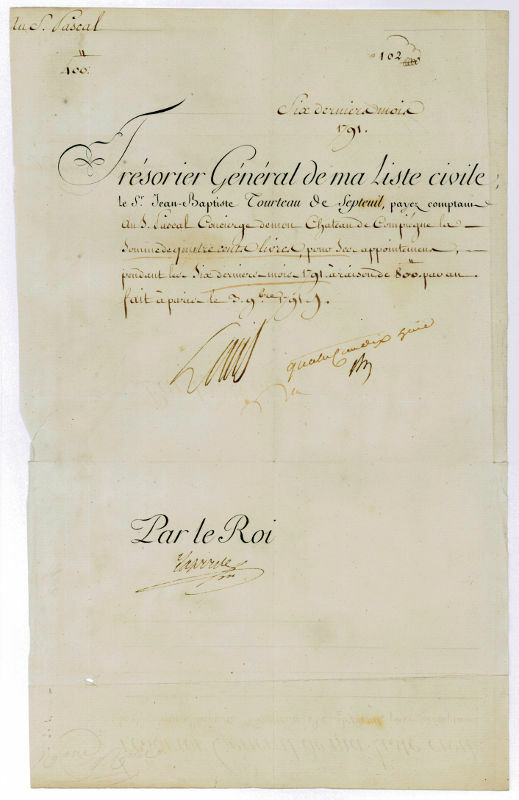 Also with the King's secretarial signature ("Louis") to the right of his authentic signature. - Remnants of prior mounting along right edge verso, few short closed separations to folds.